My name is Andre Lee and I am the Associate Director of Housing, Recreation, and Childcare. I am grateful for the opportunities I have had over the past 30 years, and for the connection with this campus that began 17 years before that. My first memory of this campus was taking a very long walk through a massive forest of trees and suddenly coming to a clearing. In front of me was a huge lake, the water glistening from the sun shining brightly above. Of course that’s what it was like in 1970 and to a small boy of six years old it was a great adventure. That lake is, of course, the Jack Finney Lake just over Dumas Road. 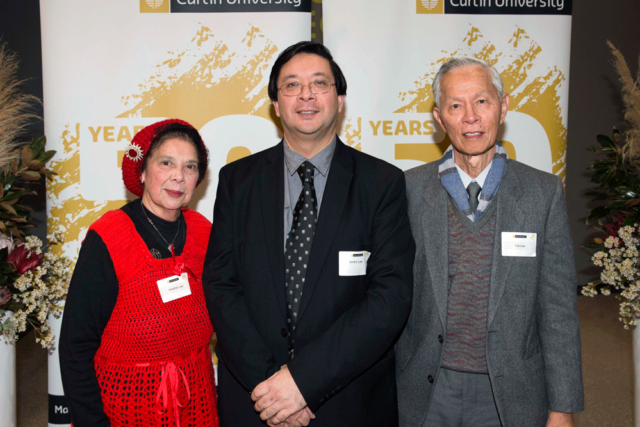 This year we celebrate 50 years of WAIT and Curtin. This University began in 1967 as the Western Australian Institute of Technology. My own story begins shortly after. My father came to work for WAIT in 1969 and as a family we came to Perth from Hong Kong in 1970. Throughout the next decade we would often come to Curtin for family photos as it was such a picturesque campus. There was even WAIT Fair, a predecessor to the Curtin Open Day. I remember there were things like chocolate wheels and one year we won a frozen chicken. One of the early memories I have as a young boy is of the pond adjacent to Hayman Theatre, which is still there. My next encounter with WAIT was when attending Bentley Senior High School, which you may know now as Canning College. For five years my father would drive us to the WAIT campus and while he went off to work in the Library I would walk across the campus to school. There were exciting things held here including the annual book sale in the Cultural Hall, which is now the Curtin Student Guild, and double feature films on Friday nights in the Hollis Theatre. Then, in 1981, there was one casual position left in the Department of Physics for a Year 12 student, and literally through the toss of a coin by my science teacher I began my first casual job at WAIT at the age of 16. The pay was $3 per hour and with my first pay cheque of $15 in hand, I opened my bank account. For the next few years I studied at that other university across the river, graduating in Economics and thinking that my future would involve working somewhere in the CBD. Then, in 1987, thirty years ago, there was casual work for a couple of days at Curtin in Financial Services. They needed someone to sort out the family name from the personal name of Asian students as they opened an account with a payment under one variation and invoiced them under an account under a different name variation. The two-day job lasted another two days as there was more work, then another week, another month and so on. I understand that there are now over 8,000 onshore international students. Back in 1987, I was asked to do the accounting for all of the international students and also work out the income distribution. This was all done by hand on a piece of paper just larger than A3. There were 26 students on that list and the International Office comprised Karen Shanks and one other staff member. The international student population continued to grow and by the time I left Financial Services it was 600. I remember that number as all invoices were hand written and every semester I had the job of writing invoices for their deposit and for the balance of their semester fees. Many pens were used up in that process. While we now take technology for granted, in the early 1990s I remember writing a memo to the Chief Financial Officer, Mr Wayne Hibble, to say there was a fairly a new item called a personal computer and a program called a spreadsheet. It would greatly improve our efficiency in reconciliation if we could have one put on a shared desk and allocated to each person for two hours each day. Speaking of income, in those early days, international students would pay their $8,000 fee by cash. They would withdraw it from the bank and then come to the main cashier to pay their fees. We would often get a call from the bank branch on campus asking if we could make a deposit as they were running out of cash. And so the cycle continued back and forth each day. If I could have made a secret marking on some notes I am sure we would have seen the same note several times during a day. My proudest achievement was my involvement in the development of the Curtin Stadium. By 2003 plans to develop a stadium had stalled, but I had the idea of asking the Executive Director of Properties if I could draw on capital funds to build the first indoor courts if the squash courts in building 108 were made available for alternative uses. Occupational Therapy is now in that building and the stadium idea gained momentum. With its use for examinations, graduations, and events, the Curtin Stadium was completed in 2009 with the help of some great champions of the project including Professor Jan den Hollander, Ric Scott, Martin Dunleavy, and Steve Harvey. Another great achievement was the opening of the new Agricola project earlier this year in Kalgoorlie, which provided 180 new and 48 refurbished places for students. Some of the more interesting concepts brought to Curtin that did not progress included a golf driving range and a white water rowing course. What we do have at Curtin are great mentors and I have had the luxury of having fantastic ones over those years. My first Team Leader and mentor was Steve Whitehead and I learnt from him how important it is to understand the big picture, and how important everyone’s part is in the total process. Other great mentors included Wayne Hibble, Dennis Ham, Martin Dunleavy and Wendy Brophy. Wendy was the first Director of Campus Life and was recognised last year for her 40 years of service to Curtin. Over the last decade my current Director, Michelle Rogers, has shown me the importance of flexibility in supporting students, especially in difficult situations, and the value of the student experience. She truly leads her team by example. Achievements at Curtin are the result of many individuals working as a team and I have been blessed with great teams over the years. I want to recognise the dedication of the staff in my current teams from Housing Services, Curtin Stadium and the Curtin Early Childhood Centre. I have always felt that while we are a Curtin community we are also a Curtin family. My father was a member of the Curtin Library staff for 26 years and my mother was in the Department of Applied Physics for 21 years. I am very happy to have my parents here tonight. This year also coincides with the third generation of our family to study at Curtin. My daughter Bethany has just completed her first semester of study in Engineering. There have been so many fantastic people to work with and to learn from over the years. Above all I am inspired each day by you my colleagues who have shown your dedication, loyalty, and commitment, always thinking what can best advance Curtin and the student experience. This is an edited version of Andre Lee’s speech given at an event to honour long service staff, 1 August 2017. The photograph above shows Andre (centre) and his parents Lee Ching Tat and Heather Lee.